Does Raw Cacao Cause Permanent Damage to the Liver? Beet and lemon juices are known in the natural healing world as good agents to help the liver with detoxification. "Lessons From the Miracle Doctors" author Jon Barron suggests using beets in particular to detoxify your liver periodically. However, Barron does not recommend using fruit and vegetable juices together. As with any matter concerning your body consult with health and nutritional specialists before starting any new diet or medical regimen. You only have one liver and it is of the utmost importance to take care of it. Healthy liver cells are capable of regeneration; however, once diseased these cells do not regenerate according to literature provided by The National Digestive Diseases Information Clearinghouse Of course you could always try to get a liver transplant but finding a match could take many years. Beta vulgaris -- beets -- have a deep-red colored flesh. There are other varieties, but the crimson-fleshed beets have the higher nutritional and medicinal value according to research done at the University of Wisconsin- Madison in 2002 regarding beet pigments called betalins and their role in detoxifying the body by purging carcinogens. Beets contain high levels of the antioxidant betaine at 175mg per cup serving.. A study published in "World Journal of Gastroenterology" in March 2010, where betaine was used in liver-diseased mice, supported the use of nutrition as prevention and treatment for liver cancers.. Beet's fiber or pectin is effective for the absorption of heavy metals and other toxins which are filtered by the liver and passed into the bowels. Medicinal properties of the lemon have been known for centuries. It is probably one of the first natural remedies you grab when you have a cold or sore throat. The lemon is composed of mostly water and contains a large amount of the antioxidant vitamin C. A 224g serving of juice holds 225.24g of water and 94.4g of vitamin C. Because of its high acidity, lemon juice is effective in breaking down foods in the digestive system, especially fats. Additionally, according to a study from the University of Buenos Aires, Argentina, the terpene, d-limonene contained in lemons may protect cells from cancer. Use these juices as a regular part of your diet to keep your liver and digestive system in shape. Buy organic beets and lemons to avoid pesticides like nitrates, which are readily absorbed by fruits and vegetables.. You also may need to buy a juicer to harvest all of the juice with the fiber which is usually found in the peels. 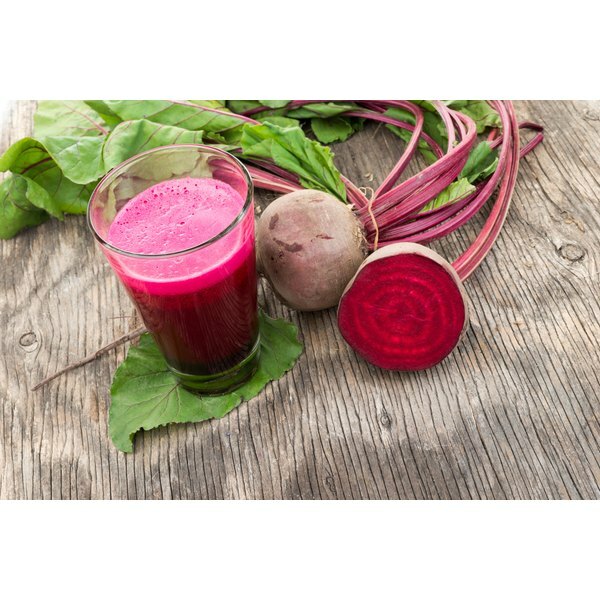 Be careful not overuse beet juice, as you can acquire a condition called methemoglobinemia which causes the blood cells to lose oxygen-carrying capacity. This condition is characterized by bluish skin color and blood test will show a hemoglobin build up. Also avoid using beet juice if you are prone to calcium oxalate stones in the kidneys since beets possess high levels of oxalate. Drink a tall glass of water spiked with the juice of 1/2 an organic lemon every morning. This will stimulate your liver enzymes and stomach to make more acid allowing the breakdown of more fats.